A short video featuring an accident victim trapped inside a burning car and died in an accident at KM 254.8 North-South Highway. The video is going viral on the social media. The accident occurred at about 9am on Thursday involving a car and trailer. In the 40 seconds video, it showed a group of motorists trying to help the man out from the burning vehicle but the intense heat prevented them from prying open the twisted door. The lorry driver and his assistant escaped unhurt. 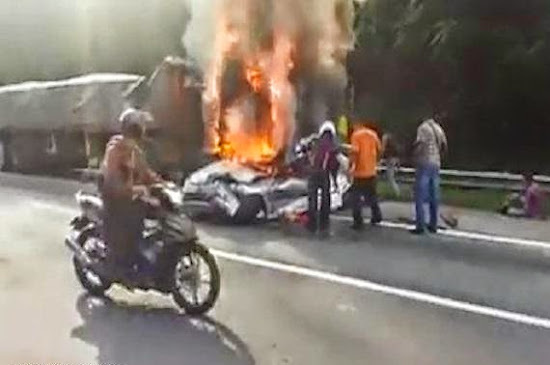 It was understood the car was heading towards Kuala Kangsar, Malaysia when the accident occurred.